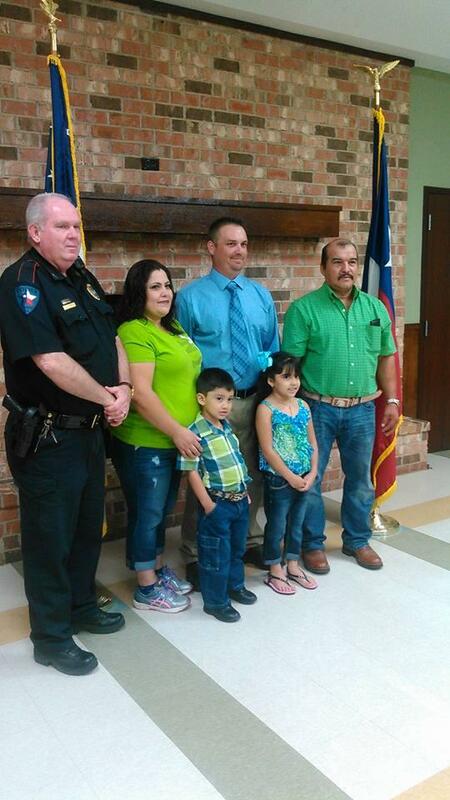 Corrigan, August 25, 2015: Officer Charlie Murray (center) is joined by Corrigan Police Chief Darrell Gibson and the Silva family for a picture after being recognized by Corrigan City Council. Officer Recognized for Life Saving Efforts, CORRIGAN, August 26, 2015 - On the evening of August 25, 2015, the Corrigan City Council took time to officially recognize Officer Charlie Murray for his quick thinking and life saving efforts while on duty on the morning of June 24, 2015. On that morning, Officer Murray was on patrol in the 900 block of Hendry in downtown Corrigan when he spotted a double wide mobile home that was on fire. Murray went the front door and beat on the door until the family was awakened. Murray helped homeowner Elezar Silva and his wife and their two small children get safely out of the home. The mobile home was ultimately totaled, but the family was saved and that puts everything into perspective. Mayor Pro-Tem, Johnna Lowe stated that "...the fact that you acted so quickly, shows that your first concern is with the safety and well being of the residents of the City of Corrigan". The Silva Family, Corrigan City Council, Police Chief Darrell Gibson, Murray's fiance', Missy, and many others were on hand for the occasion. A young family's mobile home burns in Corrigan. Officer Saves Young Family as Double Wide Mobile Home Burns, CORRIGAN, June 24, 2015 - A double wide mobile home that was home to a young family caught fire at around 3 am on June 24, 2015. Officer Charlie Murray with Corrigan Police Department was on patrol and spotted smoke coming from the home. Murray knocked on the door and was about to kick the door in when the owner was finally awakened and came to the door. Corrigan Volunteer Fire Department was dispatched to the 900 block of Hendry Road in downtown Corrigan. Murray helped get the family safely out of the home. The home was owned by Elezar Silva and his wife and their two small children. The fire was stubborn as Corrigan firemen were soon backed up by fire departments from Diboll, Livingston, and Onalaska. It took firemen over 2 hours to get the fire extinguished. It is not known to PolkCountyToday.com whether or not Silva had homeowners insurance. The cause of the fire is under investigation. Exhausted firemen recover on the lawn of the home.